Grammys 2007 have come and gone! | Random Musings of Bizzle! Grammys 2007 have come and gone! Well, the Grammys have come and gone and I almost missed it. In my eager anticipation of the Oscars, I almost completely forgot about the Grammys. I was disappointed that Mary J Blige didn’t win as many awards as I thought she would, she won 3. The Dixie Chicks just kept on appearing onstage for one award after the other. They won the big 3 awards of the night – Album, Record & Song of the Year. Carrie Underwood won the Best New Artiste. I enjoyed the performances particularly those by Shakira & Wyclef, Justin Timberlake and Chris Brown. As usual, the creme de la creme of the entertainment world turned up. 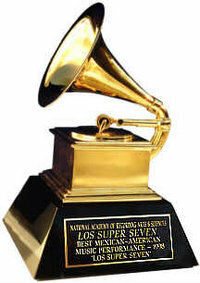 Check out Grammys.com for more details. ~ by bizzle4rizzle on February 13, 2007.